The davit arrangements type ZZ-ZOT are included in the life-saving equipment of vessel and are intended for gravity launching of life raft with set of occupants onto water. The life rafts are pulled from deck outboard vessel after the unloaded outrigger has been slewed. The davit arrangements operate at vessel's heel up to 20° at-either side and trim up to 10°. 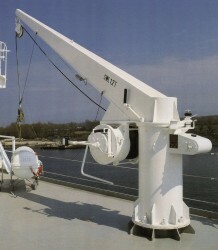 The davit arrangement consists of the radial davit type ZOT, life raft winch,automatic hook and rigging. The davits are provided with remote control of winch brake from inside of the launched life raft. - issued by marine Classification Societies.